The Canadian dollar continues to lose ground and is lower in Friday trade. 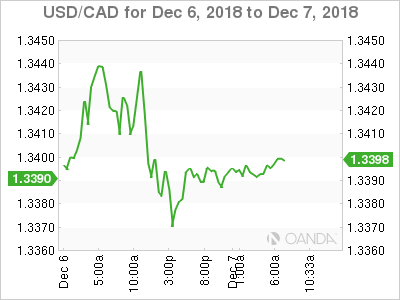 Currently, USD/CAD is trading at 1.3391, up 0.19% on the day. On the release front, the focus is on employment data in both Canada and the United States. Canadian employment change is expected to dip to 10.5 thousand. In the U.S, the markets are bracing for a weak nonfarm payrolls report of 200 thousand. The week wraps up with UoM consumer confidence. As well, OPEC members are meeting in Vienna. The results of this summit could affect the movement of the Canadian dollar. Investor risk appetite has swooned this week, sending equity markets sharply lower. This has also pushed the Canadian dollar lower, with USD/CAD close to 1% higher this week. There was some optimism early in the week after President Trump agreed to suspend further tariffs against China for 90 days. However, there are concerns that the two sides will not be able to close the gaps in their positions in just a few weeks. The markets soured on Thursday, after a senior Chinese executive, Meng Wanzhou, was arrested in Vancouver for allegedly violating trade sanctions against Iran. Wanzhou faces extradition to the U.S., and China’s indignant response to the arrest could torpedo upcoming trade talks between the two countries. U.S employment data was soft on Thursday, raising concerns that the red-hot labor market could be slowing down. The November ADP nonfarm payrolls was expected to drop, but the plunge was much sharper than expected. The indicator fell to 175 thousand, missing the estimate of 195 thousand. If this is a precursor of the official nonfarm payrolls report on Friday, the U.S dollar could retreat against its major rivals. Unemployment claims also disappointed, as the reading of 231 thousand was above the forecast of 226 thousand. There was better news from the services sector, as ISM Non-Manufacturing PMI improved to 60.7, easily beating the estimate of 59.1 points.